Take a look at this advertisement. What is the first thing that comes to mind? Shock? Anger? Hatred? Fear? Would you think it was for Homeland Security? The 9/11 Memorial? In actuality, this advertisement was pitched for the World Wildlife Fund. "The concept was summarily rejected by W.W.F. and should never have seen the light of day. It is an unauthorized use of our logo and we are aggressively pursuing action to have it removed from Web sites where it is being currently featured." If the WWF wanted publicity, they sure got it. Creating a compelling and provocative advertisement is good way to get attention, but in this case, it is the wrong kind of attention. 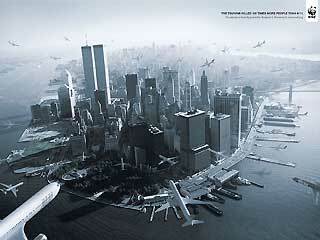 Although this ad was released accidentally, the past cannot be changed and theWWF has been labeled. Bad publicity sticks with a company for a long time, and is forever on the Internet. To avoid negative publicity and become a headline story like theWWF, follow these Do's and Don'ts of Advertising. Learn from Other Campaigns Each advertising campaign is unique, but lessons can be learned from every single one. Take a look at successful advertising campaigns and recognize what worked and why. Do the same for the campaigns that did not do so hot. The successful campaigns will have something in common, maybe a catchy line or a creative ad. For the campaigns that failed, their thing in common will be their mistake that caused their downfall, such as an offensive image or slogan. Although it is important to learn from other campaigns, it is just as important not to copy them. More on this later. Try for the Attention Getter Americans are exposed to hundreds, if not thousands, of advertisements per day. Without an advertisement that grabs people's attention, nobody will notice your ad. Be creative. Stand out from the rest and do something outrageous. But, use your head. The WWF ad is a great example of trying for an attention getter, but failing miserably. Plan Ahead No advertising campaign will be successful without sufficient planning. A budget needs to be in place to know how much you are willing to spend on the campaign and any repercussions it may have. In the case of the WWF , the bad publicity is costing them money to defend themselves as their rejected ad has spurred conflict and outrage across America. Not only will they have to deal with the media, but with theirWWF members and supporters as well. Check, Re-Check, and Check Again Before putting your ad out to the public, be 100% positive that you want your company to be represented by this advertisement. Some provocative campaigns are risky, so be ready for any reactions the public might have. Once you have released your advertisement, be sure to stand beside it proudly and support it fully. Although the WWF rejected the controversial ad, it still made its way onto the Internet. The lesson to be learned here is to be sure that every rejected ad (especially those that are sure to stir up drama) should be destroyed. One way to keep tabs on what the public is saying about your brand is to have community monitors. Acting as your company's "brand police," community monitors watch the Internet, especially social media sites, for any comments about your business's brand. Copycat The advertising campaigns that struck gold did for a reason. They were new, creative, and sparked the interest of the public. Chances are, copying a previous campaign will not be as successful the second time around, and the public will recognize the duplicate scheme. Forget to do Your Research When working with an outside company for advertising, it is essential to research their previous campaigns to get a sense of their design. Find out if they had one bad campaign, and figure out why it failed. Even in campaign production and concept design, it's important to consider your sources. Without conducting thorough research, you could end up in a situation similar to the WWF. Make False Claims The most important part of any advertising campaign, or any advertisement, is to be honest. Making claims that are false is not only illegal, but will spur negative publicity and leave your business with a negative reputation. Lose Brand Focus Remember why you are advertising, it is for a reason. It is important to have the idea and importance of your business as your focus the entire time. This was a major problem for the WWF ad. The WWF regularly promotes its Fund through animals, wildlife, and nature. The public has linked the two together, and it has become the image and reputation that America is familiar with. Adding the traumatic historic event of September 11 into their advertisement has put a negative label on their brand making it a controversial ad.